As I mentioned in my recent blog post Am I an Artist?, cards featuring two of my paintings are now available through Pamba Toto. 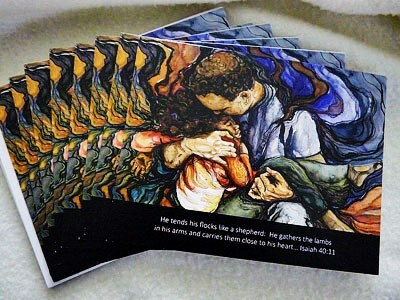 10% of card sale profits benefit Sanctuary of Hope homes for orphans in Nairobi, Kenya. 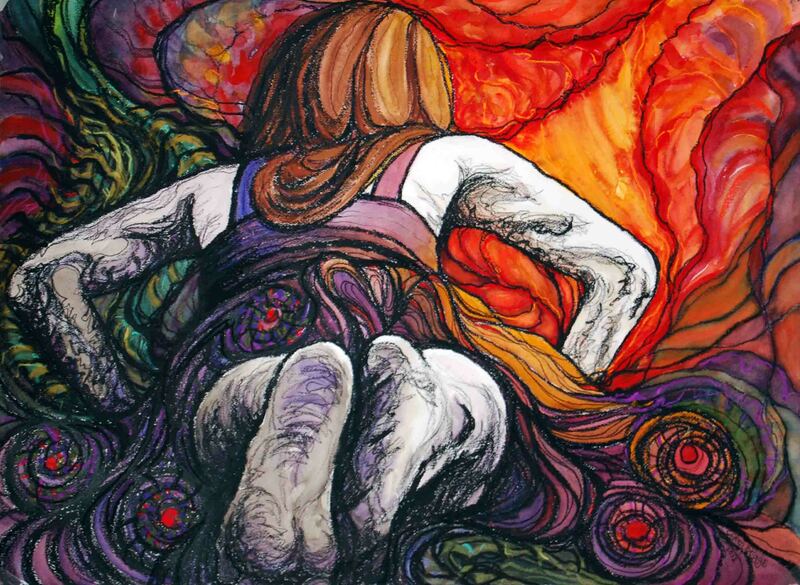 ORIGINAL: Summoned; 2013; 22″ x 30″; pastel and watercolor. FINE ART PRINT: limited edition of 100; 13 1/4″ x 17 3/4″. Summoned (click here to view original blog post) was created as a meditation on the calling of Jeremiah (Jeremiah 1:4-19) and the calling of each one of us. Suddenly, out of nowhere, like Moses’ burning bush, like Jacob’s ladder, the summons comes. Anticipation trembles like leaves before a storm. Status quo groans and grumbles. Like Lazarus, I throw it off as so many dead rags. I lift my head. I’m undone. Suddenly knowing if only the light will touch me, shine through me, it is enough. I am summoned to rise up. As are you. Cards: Cards with envelopes are sold in packages of 8 for $14. Click here to view or purchase cards on the Pamba Toto website. Fine Art Prints: Click here to view or purchase a fine art limited edition giclee print of Summoned. 10% of profits from all print sales benefit Sanctuary of Hope. ORIGINAL: Carried; 2012; 16.25″ x 20.25″; mixed media: charcoal, watercolor, pastel. FINE ART PRINTS: Limited edition of 100; 14″ x 17.5″. Carried (click here to view original blog post) contemplates the wonder of being carried by a God who is always for the orphan, broken-hearted, down-trodden, and vulnerable. A soul steps off a precipice, utterly free-falling at last. Only to be gathered up and carried. On the day when evil threatens to overwhelm, when our last shred of hope leeches away, when we cry out to God, He hears. He speaks into the darkness, “Enough!” He sees the last spark of light in our soul and shields its tiny flicker. Even so, let us carry on His behalf the free-falling in our midst: the orphaned, the widow, the vulnerable. 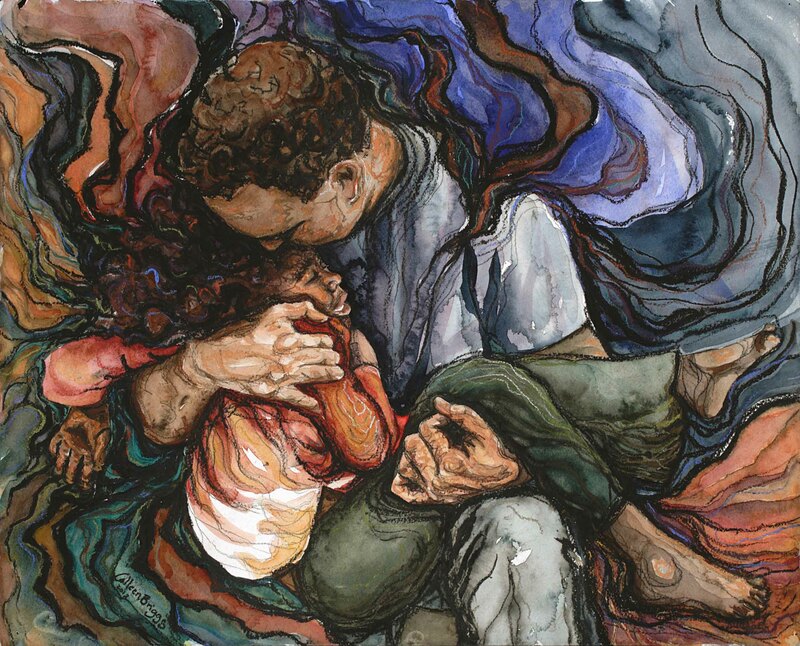 Fine Art Prints: Click here to view or purchase a fine art limited edition giclee print of Carried. 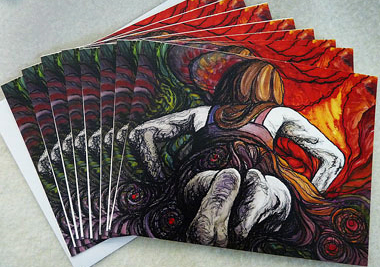 10% of profits from all print sales benefit Sanctuary of Hope. Your artwork is exceptional. The colors are radiant and the images are powerful. Thank you for sharing your experiences on being an adoptee! I’ve appreciated reading your blog entries. They help me get inside the heads of my two precious adopted kids.